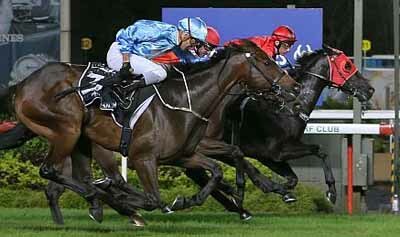 Having won the Group 3 Saas Fee Stakes at his last start last November, BOLD THRUSTER was always going to be the one to beat in the Group 3 JBBA Singapore 3YO Sprint, the first leg of the 3YO Challenge, at Kranji here tonight. The Turffontein gelding as usual went to the front as the field settled down but unlike his last four wins when he was hardly challenged, he had to hold on for dear life in the final 50m after kicking clear at the 200m. First, SIAN VIPASIRI was breathing down his neck, then TOP KNIGHT put on "wings" on the outside and just failed to catch BOLD THRUSTER by a short head. It was the fifth win in seven starts for the gelding. "It was a big run. He was first-up, hasn’t raced for five months and had to carry 57kgs for the first time,” said trainer Shane Baertschiger. "Don’t forget he was running against horses who were hard fit from having already had a few runs under the belt. He will improve after today."